I don't know about you guys, but I always have a hard time keeping calm around the holidays. Every year I get the idea that frosting sugar cookies with royal icing is a good idea and that this time I won't get tired and bored after the third cookie even though I know I will and the recipe makes about four dozen million. I've gotten the itch again and just ordered 7 new cookie cutters from Amazon so I'm pretty much committed now. Between that and trying to shop while absolutely everyone else in the city is also out shopping it can be tough to have a relaxing holiday. Luckily this year I've already finished all my shopping so I'll just hermit up inside and bake for the rest of the month. Here's a present idea that might help keep your shopping list a little calmer this season. 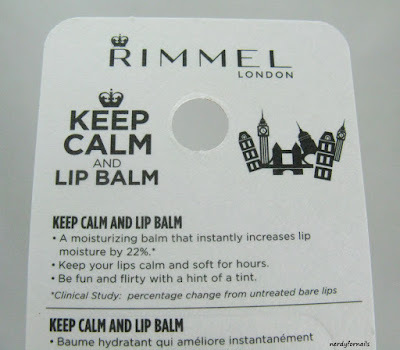 Rimmel has come out with these adorable Keep Calm lip balms just in time for Christmas which I think would make really cute stocking stuffers for people who are addicted to lip balm. I already have about 20 different kinds hiding out around the house, but I'm always more than happy to get a few more. If I have to move more than 3 feet to get to my closest balm I become the opposite of calm so I make sure I'm stocked up. 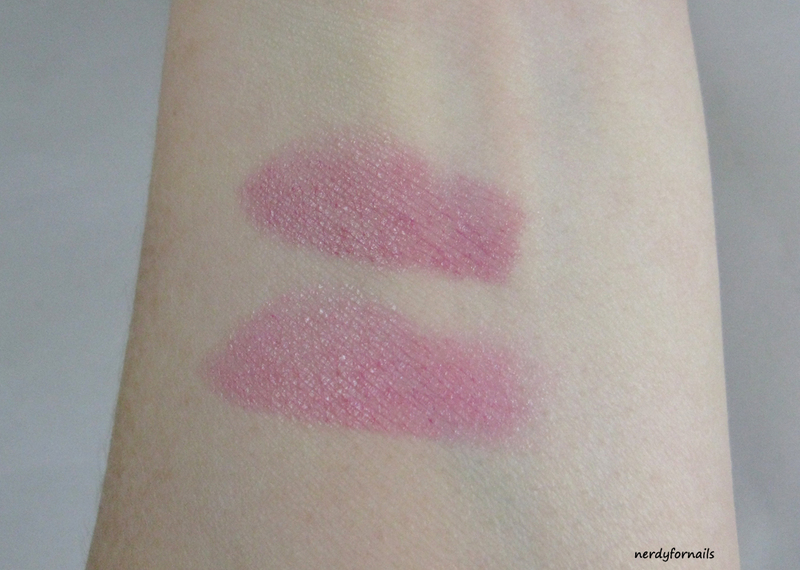 I received a couple of these balms to review so read on to see what I thought (these are a press sample, but opinions are my own/honest). I also got an extra set and wanted to do a holiday giveaway for all my favorite readers. Enter at the bottom of this post. The colors I got to try are Keep Calm and Rock (berry blush) and Keep Calm and Party (violet blush). 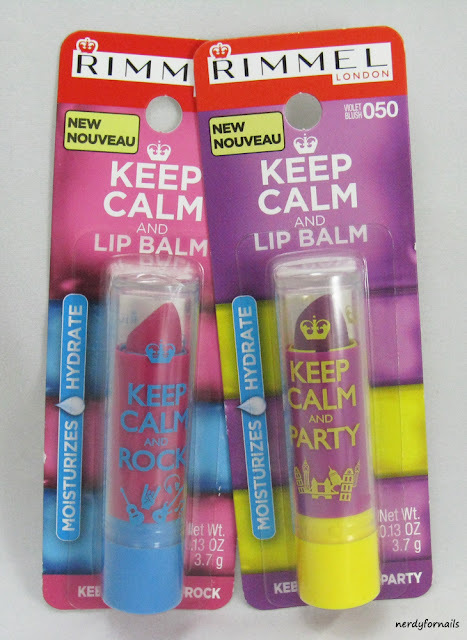 There are five varieties total including Keep Calm and Shop (clear), Kiss (pink blush), and Play (rose blush). They aren't scented to match the colors, but all seem to smell the same. To me it's a mix of rose water and baby powder which I actually rather dislike. I'm not a big fan of most scents in general and especially not so close to my nose. I could only manage to wear these for a few minutes before I had to wash it off due to the perfumey smell. If scented products don't bother you then I'd say go for it, but if they do you might want to skip this one. The Keep Calm Lip Balms claim to increase lip moisture by 22% vs bare lips. The texture was nice and felt pretty moisturizing, so I could agree with this claim. The tints are nice as well. 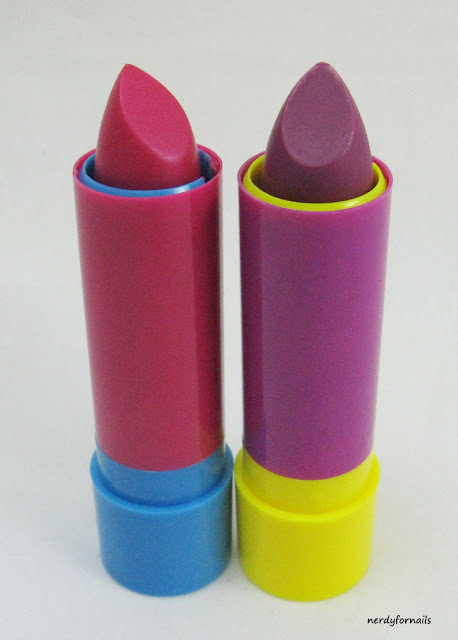 This is something I'd probably throw in my purse for when I'm too lazy for lipstick (which is about 98% of the time). The packaging is probably my favorite part though. 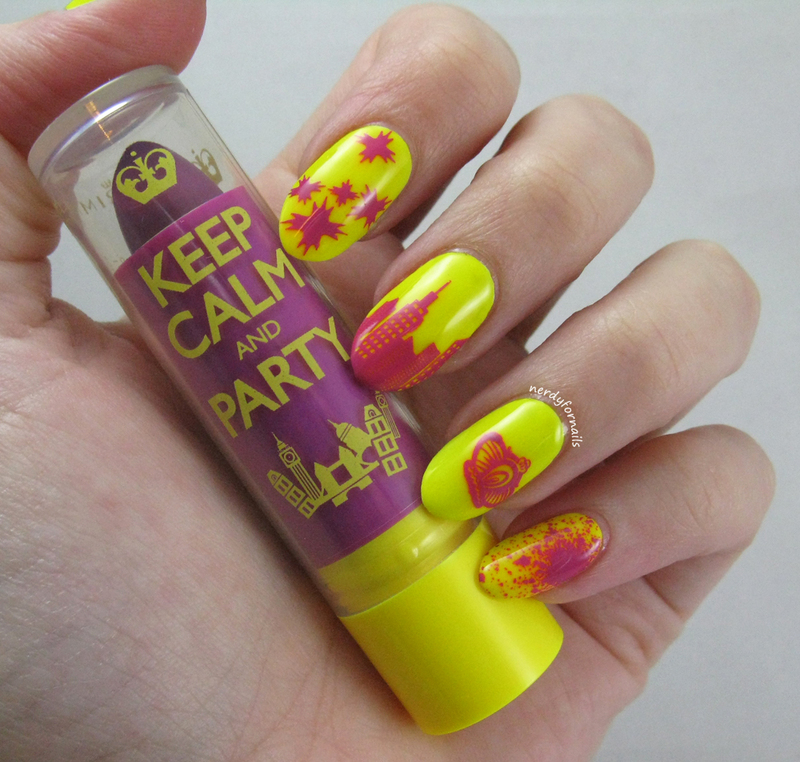 I love the bright colors and Keep Calm theme. These are sold at most major drugstore chains for $2.50. I've swatched these on my arm to show the colors. 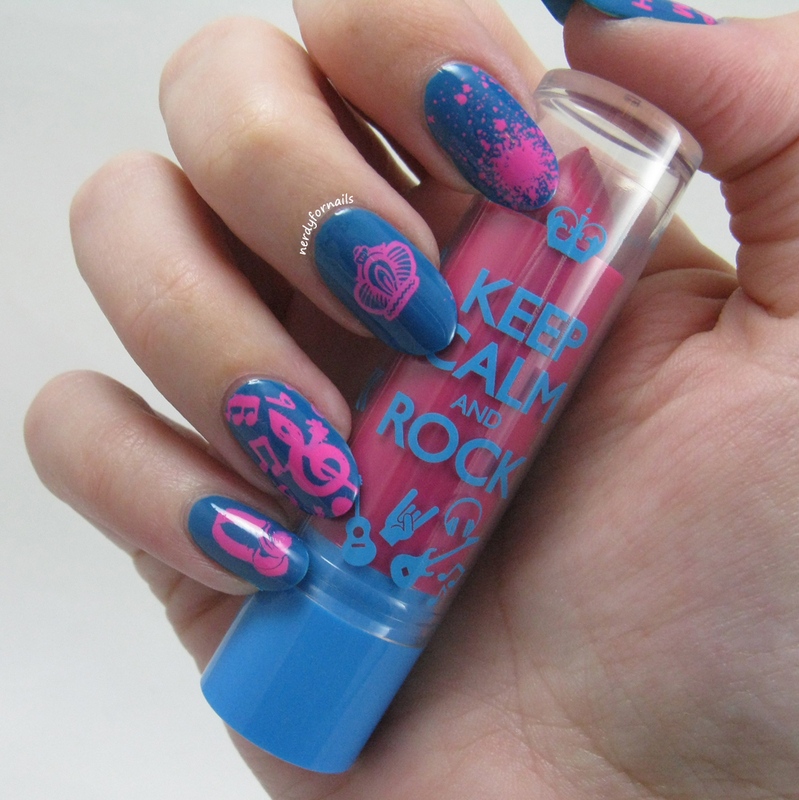 The top is Keep Calm and Party (violet blush) and the bottom is Keep Calm and Rock (berry blush). I think the tint is just enough to give lips some color and still look pretty natural. And here are the obligatory nails. 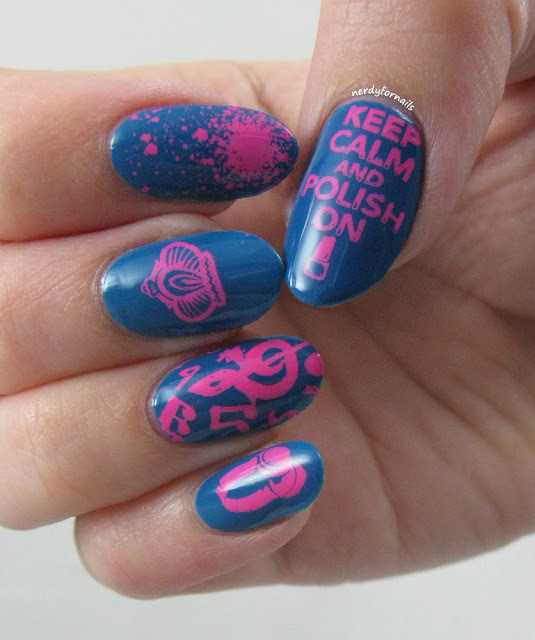 I'm glad I finally had a valid excuse to use my Keep Calm and Polish On stamp (Bundle Monster plate BM-619). I painted each hand with colors to match the balms so you get to see the mythical right hand this post. For the Rock nails I used LA Colors, Static Electricity for the base and stamped with Mundo de Unas #15 with Bundle Monster plates BM-610*, BM-320*, BM-411 and BM-423 (*also used on the other hand). For Party my base is LA Colors, Hysteria (a white base is highly recommended to make this yellow pop) and MdU #21 with plates BM-414 and BM-202. When I took these of my cotton balls looked like neon cotton candy. The prize is one Keep Calm and Rock and one Keep Calm and Party as pictured above. 2. Must be a resident of the US. 3. No giveaway accounts- these will be disqualified. 5. The winner will be notified by email and will have 48 hours to claim their prize. If the prize isn't claimed within 48 hours a new winner will be chosen. 6. Other legal stuff I forgot/don't know about? So official, these rules. 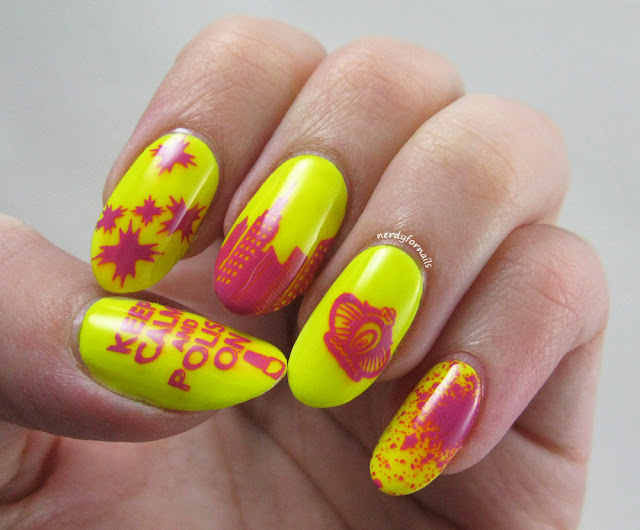 Love the mani you did here. I'm a new follower for your blog, but it seems great so keep doing what you're doing! I love your use of neons!